March 02, 2016, 9:32 a.m.
For the first time in history, the next Prime Minister will be chosen directly by the Conservative Party membership. YouGov has created a panel of Tory members and is using the same weighting method we employed for our Labour leadership race last summer, which first identified Corbyn&apos;s ascendancy and then accurately predicted the scale of his win. YouGov shows that while Johnson&apos;s net rating among Tory members has declined from +77 to +62, he now leads the pack of leadership contenders with 43% saying they will vote for him (up from 38% a few days earlier), while 22% support George Osborne (up from 20%). Johnson and Osborne are gainers from Theresa May (down from 21% to 19%) and Sajid Javid (down from 11% to 7%), who both disappointed some of their supporters by staying loyal to the party leadership in spite of having been seen as euro-sceptics. Nicky Morgan is unchanged on 1%. These changes are not mere fluctuations with margins of error as we interviewed the same 1005 members. 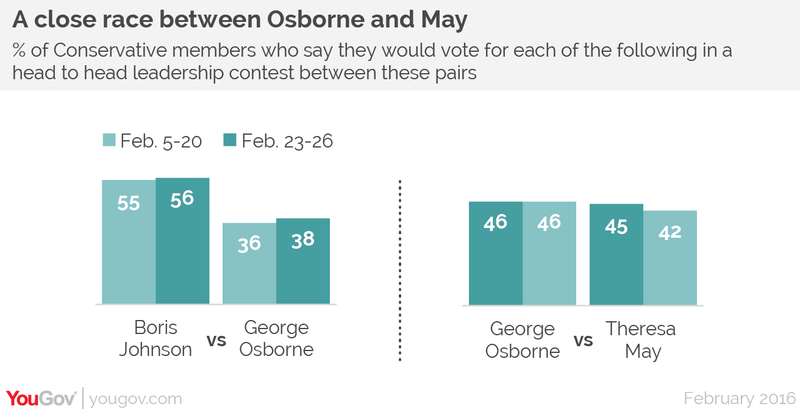 In a head-to-head contest Johnson currently beats Osborne by 56% to 38%, and Osborne beats May by 46% to 42%. Support is strongly correlated with opinions about Brexit. Tory members support leaving the EU by 59% to 31%, with the numbers for Johnson supporters at 80% to 14% with Osborne supporters showing the reverse preference with 54% wanting to remain in versus 33% who prefer to leave. Only 42% of Conservative party members judged Cameron to have achieved a &apos;good deal for Britain&apos; versus 55% who saw it as a &apos;bad deal&apos;. But the anti-EU mood in the party is unlikely to lead to recriminations later: among those who are in Conservative-held constituencies, only 11% would like to see them de-selected if their MPs campaign for staying in. Boris Johnson&apos;s winning qualities are his ease in front of the camera, his political instincts and being in touch with ordinary people. However, he falls behind George Osborne (who is second to Theresa May here) on being most prepared to make tough decisions (34% for May, 31% for Osborne and 22% for Johnson), and the same pattern emerges on ability in a crisis (33% May, 28% Osborne, 21% Johnson). 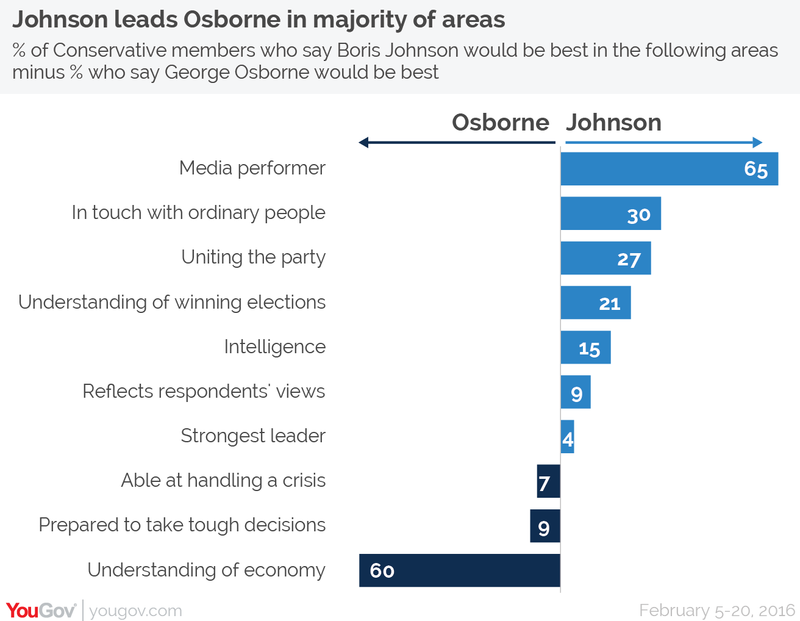 George Osborne is seen as the weakest candidate of all on being in touch with the concerns of ordinary people, where Sajid Javid (22%) comes in second to Boris Johnson (36%) and only 6% choose the Chancellor. Conservative members say the most important criteria in deciding who should be their next leader is having someone who would make a competent Prime Minister (67%), followed by having the best chance of winning in 2020 (56%), having good policy ideas (45%) and being able to unite the party (44%).